The pretty resort town of Desenzano del Garda is on the southern shore of Lake Garda (Lago di Garda), Italy's largest lake that straddles the northern regions of Lombardy, Veneto, and Trentino. 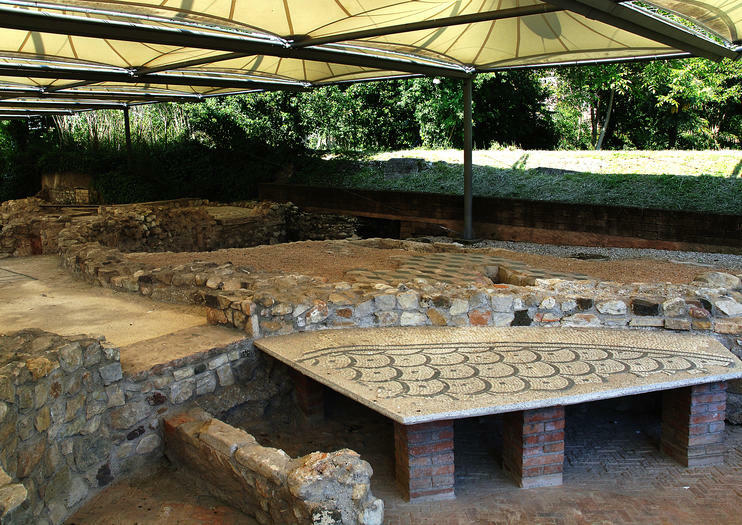 A popular destination for ancient Roman nobility from nearby Verona, the town is home to the ruins of a Roman villa and a museum of artifacts unearthed during its excavation. There is also an archaeological museum, a picturesque harbor, and a waterfront promenade. Desenzano del Garda is one of a number of lovely towns set on Lake Garda’s southern shore, including Peschiera del Garda, Sirmione, Bardolino, Garda, and Lazise; on the northern riviera sit the towns of Salo, Malcesine, Torri del Benaco, and Limone sul Garda. The easiest way to visit these lakeside towns from Venice or Milan is by booking a Lake Garda tour, as many are difficult to reach with public transportation. You can also opt for a boat tour along the lakeshore, with free time to explore these and other towns. For a fantastic view over the lake and past the town of Riva del Garda to the peaks of the Dolomites beyond, take the gondola from the town of Malcesine to the top of Monte Baldo. The area surrounding Lake Garda is known for its excellent wineries, so consider combining a day at the lake with a wine tour. One of Italy's most popular amusement parks—Gardaland—is also nearby and the perfect destination for families with kids. Desenzano del Garda is about 76 miles (112 kilometers) from Milan and 95 miles (154 kilometers) from Venice, an easy train ride from either direction. It’s located near the town of Sirmione on the southern shore of the lake, and offers ferry connections to reach other destinations along the shore. Lake Garda is located in northern Italy, where the winter weather can be quite cold. The best time to visit the lake for outdoor activities is spring through fall. One of the most popular attractions near Desenzano del Garda is the lake’s largest island, Isola del Garda, which is privately owned by the Borghese Cavazza family. Open to the public since 2001, the island is home to a sumptuous Venetian neo-Gothic villa and surrounding estate. Discover the scenic wonders of Lake Garda on a full-day tour of Italy’s largest lake from Milan by train. With a professional guide, visit picturesque villages cradled by gorgeous Alpine scenery and delve into the rich historical heritage of the area. See ancient Roman villas, foreboding fortresses and mysterious caves; marvel at the historical charm of Desenzano’s old port; and enjoy a tranquil boar cruise to Sirmione, where archeological treasures demand attention. Additionally, enjoy some leisurely free time to explore independently on this comprehensive sightseeing tour. Get access to a private, hidden garden during this wine tasting tour in Verona. Learn about the secrets of top-quality valpolicella while enjoying tastings in a flower garden overlooking the River Adige. Your guide will provide in-depth tasting notes and commentary on the local culinary culture. Localgrapher is the largest network of professional photographers and videographers with more than 600 destinations around the globe! Book your private photographer and guide in Desenzano del Garda to capture your picture-perfect moments while visiting amazing sites!SOLO TRAVELERSFancy an insta-perfect photoshoot from your Desenzano del Garda vacation? Localgrapher has years of experience with fashion and solo travel photography! Make your memories last a lifetime and share them on social media or display them in your home to receive an avalanche of compliments. COUPLESIf you are about to propose to your loved one, honeymooning or just exploring what Desenzano del Garda has to offer, put the selfie stick aside and let Localgrapher’s superb photographers take care of the photos for you both.FAMILIES & GROUPSA family trip, wedding, bachelorette party or grand get-together? Forget missing someone from pictures, we’ll capture them all!